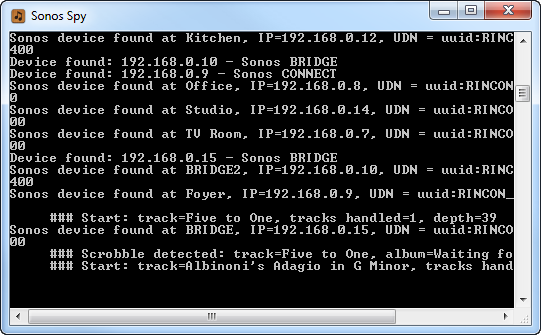 Observation & Detection (O&D) : this component observes your Sonos units, and detects your track plays. It may run on your PC, but alternatively it could be hosted elsewhere (as discussed here). 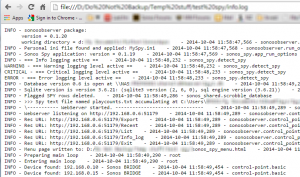 Play count processing : this component uses your track play data to update MediaMonkey, and Last.fm (optionally). It runs upon the PC which is also hosting MediaMonkey, and is the component which you interact with on a regular basis. The O&D component runs in the background, and in a typical set up you will have little need to interact with it. As an option, it may be running on a simple Linux device, with low power requirements, and no screen, nor keyboard. For these reasons it publishes a html menu, so that you can interact with it using a browser session from your main computer. 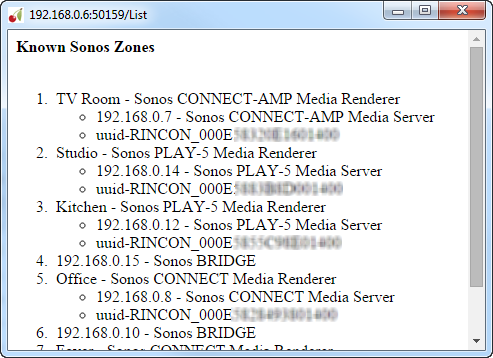 Useful for a quick check to determine whether the O&D component started ok, and whether it has successfully established communications with all of your Sonos kit. 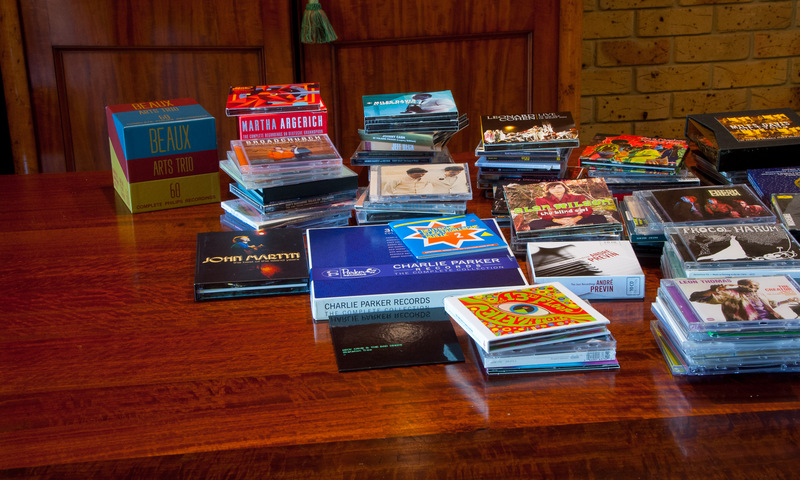 Lists the latest 10 track starts (or less than 10 if the the O&D component has just been restarted). Useful as a check to ensure that observation, detection & recording continues to function OK. If you have deployed the O&D component on a remote computer, and are using the database transfer option, this display also provides a quick check to see whether there is successful communications with your NAS, or wherever you have placed the transfer database. 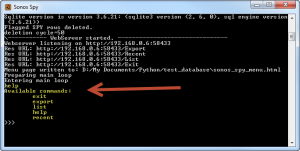 This option imports a copy of the O&D component’s current log file. It allows you to view what is going on inside that component. 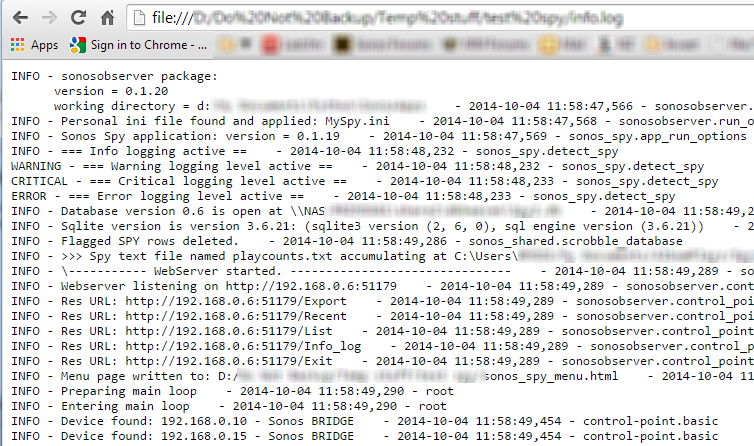 If you have any problems, a copy of this log file could be forwarded to whomever is helping you. This option returns a simple screen which displaying the location where the log file wqas written to. My browser (Chrome) has a security restriction blocking any hyperlink pointing to a local file. I presume that others do too, so you need to either create a browser bookmark pointing to the fixed file location (which is displayed on screen), or copy and paste the file location into your browsers address bar. The log file covers just the current invocation of the O&D component. 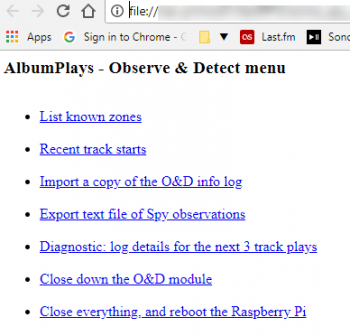 The text transfer file is an optional conduit for the transfer of track play observations from the O&D module to the Play count processing module. Read more about the transfer options here. The menu option exports the contents of the text file to the location where it will be picked by the Play Count Processing component of the AlbumPlays application. The menu option also empties the text file, so that duplicated Spy observations will not be exported by the next use of this facility. See here for instructions regarding use of the text file option. This menu closes the O&D component safely, and then reboots the computer hosting it. The O&D component will be auto-started if you have configured it to do so. This menu shuts down the Observe & Detect module, but leaves it’s computer running. This is especially important if you use the database transfer option. If this component is configured as intended, you restart the O&D component will restart when you rebooting the computer which is hosting it. A design assumption is that the O&D component will be auto-started by whichever computer is running it. 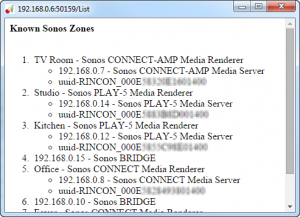 If you are running it under Windows, you may have elected to start it yourself via the “Sonos Spy” short cut created by the install procedure. In this case the application will will be running in its own window, which you will see on the Windows TaskBar. You can enter commands directly into this window. 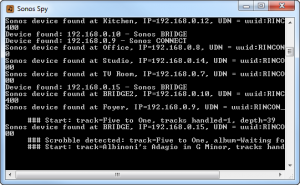 Type in help to see a list of the available commands.